I've taken care of a few UFO's and was able to give my Aunt 3 "holiday's" worth of gifts. She FINALLY got the dish cloths that I made for last year's birthday.......exactly one year late! They're knitted out of Wendy Cotton Supreme: one is turquoise, one is coral/melon and the last one is a bright yellow. She says they're too pretty to use! I told her I can make her more any time she wants, I just thought the colors were nice and bright and "summery".....and I want her to USE THEM!!!!. The final "knitty gift" was for THIS year's birthday. It was a flower face cloth made in purple Crystal Palace Cotton Chenille - from the pattern in Melanie Falick's book, "Weekend Knitting". I also gave her some hand made soap in the "Plumeria" fragrance that I'd purchased at the Maryland Sheep and Wool Festival. She loved it! (I get the feeling she won't use the face cloth either!) It was fun actually BEING here ON her birthday - we had a big cookout at the farm to celebrate.....plus, I got to see her unwrap everything in person! Oh, my! Since I'm in Illinois visiting my folks, we decided to take a trip up to "The Fold" in Marengo to visit Toni. Her shop is gorgeous and so full of everything fiber! I was so excited - she's got everything you can imagine! I had a wonderful time and so did my parents. My mom is still raving about the store (I overheard her on the phone this morning with one of my aunts!). My mom does not knit/crochet/spin, but she really enjoys the final products and is fascinated by all the wonderful wools and fibers that exist. Toni has about every kind of fiber and yarn you can imagine - including exotic fibers - like Vicuna. She has lots of spinning wheels, a few looms, and a ton of wooden drop spindles! There's a wonderful variety of knitting needles - straights and circs. She has a large selection of books - knitting, crochet, spinning, and weaving. 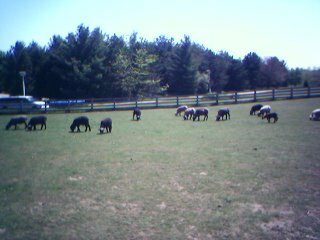 Her sheep are grazing just outside her shop - I took some photos with my cell phone, so they're not the greatest....but you get the idea. Of course, I purchased some STR (I'd missed out on that at the Maryland Sheep and Wool Festival.....I got to Toni's booth too late) Mom is buying me a skein of it as part of my birthday present! 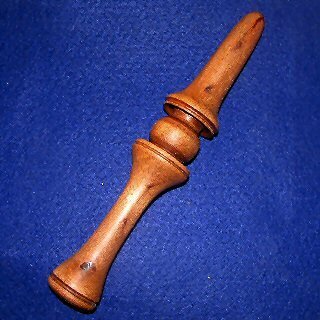 She also had me pick out one of the wooden drop spindles....I picked out a real pretty one. Thanks Mom! As soon as I get home, I'll take some pictures of it. If you're ever in the area, this is a MUST stop at shop! (In the area means within a 2 hour radius of Marengo) Toni is so sweet and her shop is wonderful! We traveled 93 miles to get there....and it was well worth it! We stopped at a wonderful restaurant, Crumpet's Tea Room in Genoa, Ill. on the way to Toni's and had lunch. Mom and I already decided that a trip to "The Fold" will be a tradition when I come to Illinois for a visit. What a Wonderful Day! My Secret Pal is the BEST!!!! Wow.....here I was in a frenzy preparing for a visit to mom and dad and I got an absolutely fabulous package from my secret pal. She REALLY knew how to spoil me. Everything was perfect! All the packages were wrapped in purple and tied with a purple ribbon. I felt like a kid at Christmas! 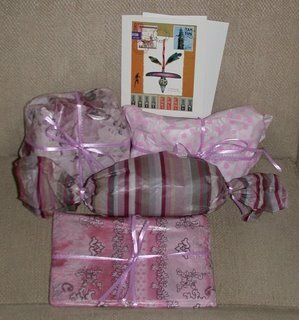 Oh the joy when I unwrapped my goodies - they were FABULOUS! The spiral bound journal and bookmark will really come in handy....they're just the right size to fit into the knitting bag! 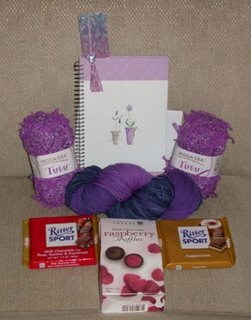 The Tutu yarn is a lush purple with interesting bits of fabric attached. I'm not sure whether to make a scarf, edge a sweater with it, or create a really cool collar for a yet to be designed sweater jacket. Hmmm......so many ideas! So little time! To keep my strength up, there were some wonderful items from my most important (and favorite) food group - chocolate. There's dark chocolate rasberry truffles, milk chocolate with rum, raisins, and hazelnuts, and cappuccino. That should keep me going for a while. The final item was some absolutely gorgeous and super-soft "Supersock" yarn from Tess Yarns (which I love!). All of my favorite colors were included, so the socks I make will be just fabulous! The colors are soooo vibrant and the yarn is soooo soft! The picture I took really doesn't show the full beauty of the yarn.....plus, you HAVE to touch it to get the full effect.....it's YUMMY!!!! Thanks so much! My Secret Pal is the BEST!!!!! This next link should bring you to the photo album for the great stuff I found at the Maryland Sheep and Wool Festival in May. I still have to add additional descriptions of what I bought or the vendor, but I wanted to hurry up and get this posted! "Baa! Baa! Black Sheep.....Have You Any Wool?" Yesterday was great fun! For the 3rd year, the Purls of Distinction Knitting Guild was asked to participate in Frying Pan Park's Sheep and Wool Day. Jo, Jerry, and I brought our spinning wheels and demonstrated how yarn is made. We had numerous samples of our hand spun skeins in various colors.....including natural colors. We also brought samples of some knitted items. Pamela and her daughter Ella demonstrated knitting. They also provided a nice variety of yarn, patterns, and knitting needles for sale.....just in case someone got infected with "the knitting bug". The Sheep and Wool Day was a small festival focused on families. Activities included sheep shearing demonstrations, spinning demonstrations, dyeing demonstrations (this year's focus was on the natural dyes), and various activities for the kids. This year, Capital Alpacas brought a couple of alpacas and demonstrated the preparation and spinning of the alpaca wool. 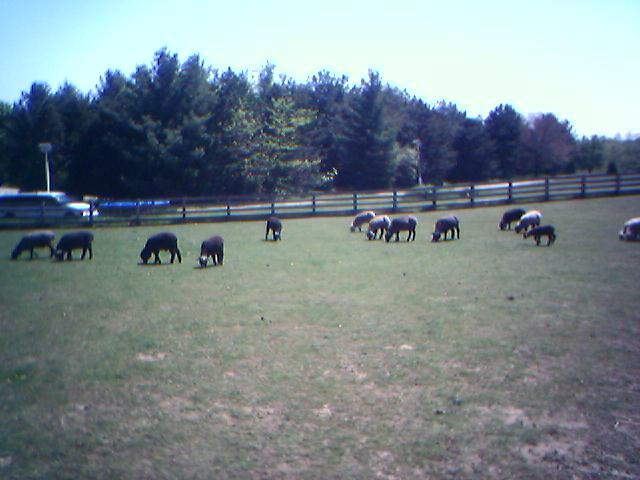 As always, since part of Frying Pan Park is a working farm, there were lots of young farm animals around to entertain - the young pigs and little lambs were favorites. I brought my older Lendrum spinning wheel (one I'd picked up second hand) and let anyone who wanted try their hand at spinning. I also put together some "Make your own knitting needle" kits with chopsticks, yarn, and sandpaper for the younger kids. Capital Yarns donated some knitting needles and yarn that we gave to the teenage/adult visitors that were interested in learning to knit. The remaining needles and yarn were donated to the park district for use with their youth and summer programs. And now for the "Black Sheep" part......Every year, I buy some roving prepared from the previous year's shearings. I generally buy the Black Welsh Mountain wool. Last year's wool was a nice black....in previous years it had been more of a grey. The two lambs' wool had been included with the "greying" mom's wool to produce the very rich black wool that I bought this year. Part of what makes this wool purchase extra special to me is that it's wool from the sheep that live at the park....I'm such a sentimental fool! My New Blocking Board....or How My Mom FINALLY Gets Her Scarf! I finally bought my much needed "blocking board". I'd been cruising the hardware stores looking for Tyvek or something similar, but never found anything that I thought was both reasonably priced and the right size. I found the perfect item at Lowe's! It's a 1/2" thick styrofoam board that's 4'x8'. The "official" purpose of the board is to provide insulation. However, I think it's PERFECT as a blocking board - it's big enough to block any stole or shawl that I plan to make. It's plastic coated on one side and foil on the other. At a cost of $8.00 for the entire sheet, it's a steal! The "official" blocking boards I've seen have run about $80.00......a significant difference in cost! Therefore, according to my calculations, I now have $72.00 that can be readily converted into yarn! On another note, my mom will be sooooo happy! I finished knitting this for her about 1 1/2 years ago.....gave it to her, and then told her it needed to be blocked and took it back. I felt guilty, but I explained to her that since it was lace, it really needed to be washed and blocked in order to see the detail. The scarf was made with ivory colored cashmere yarn I purchased from Hunt Valley Cashmere at the Maryland Sheep and Wool Festival a few years ago. The lace pattern is English Garden from Barbara Walker's Treasury of Knitting Patterns. Wow! What a discovery! You CAN teach an old dog new tricks! On Monday evening at my spinning group, we were all talking about our purchases and finds at the Maryland Sheep and Wool Festival. 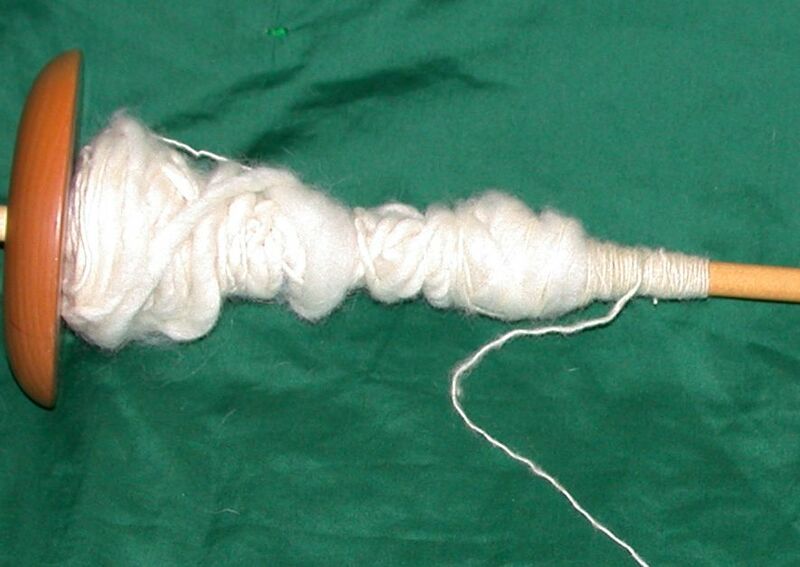 I had been fascinated by the Navajo woman who was spinning using a Navajo spindle. Well, it didn't take long before I got the hang of it (I'd never "spun off the point" before). I managed to spin several yards of yarn......and it came out nice and thin and even (I was amazed!). The yarn produced was basically sock weight, once plied. So....now I'm the proud new "owner and operator" of a Navajo spindle! Thanks Lissa! As promised to my Secret Pal, here's a picture of the Navajo spindle with the existing "yarn" on it as well as the yarn I spun. 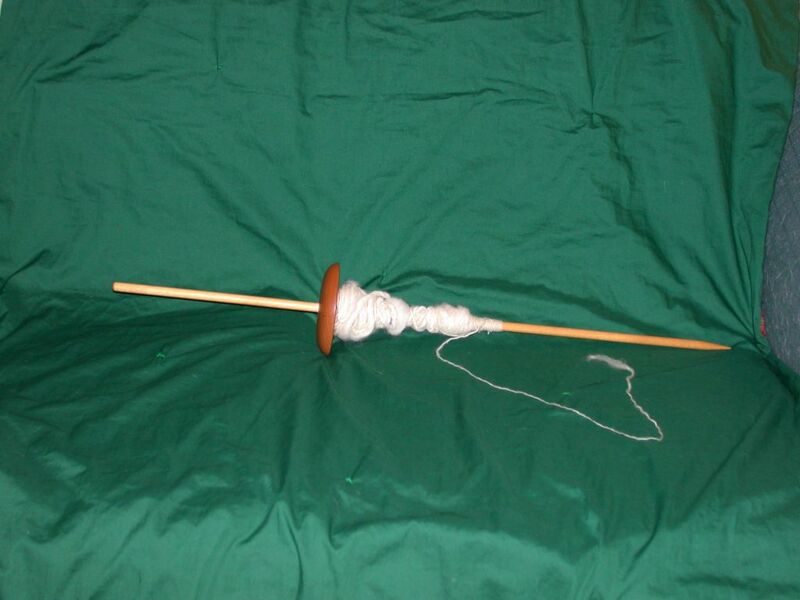 The spindle is about 2 feet tall and you roll it against your leg and spin off the point. Once it has enough twist, you wind it around the shaft. (It's much faster to spin with the spinning wheel, but this method is very relaxing and is a bit more portable.) The thin yarn that I spun is at the top of the spindle (on the right side of this picture). I'm so excited! This is my first Secret Pal! I think it's going to be a lot of fun! I LOVE wool……mostly prefer natural fibers. 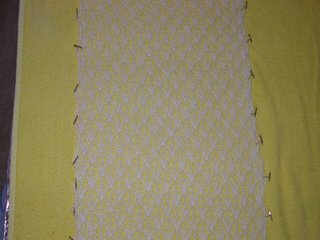 There aren't fibers I "don't like"....I may not "like" them for garments, but they can be used as edgings, to make accessories, or to provide "interest" in a knitted piece. I can probably find a way to use whatever yarn is thrown my way. Plastic tub and the ones I’m using (or planning to use soon), in a zippered case that I tote around with me. A long time….started in high school…..and that was a while ago. Probably somewhere between intermediate and advanced. Yes, but I haven’t kept it very up-to-date. Spinning, cross-stitch, felting, needlepoint, just getting into crocheting, making small handmade items – always ready and willing to learn a new skill or craft. All kinds with the exception of country music….I have limited “likes” in that area. I like everything else (yes, even Rap and Heavy Metal). Classic Rock, Ska, Alternative, Classical and “old time” Jazz are always good…..geez…..everything! Purple is my favorite…..and I really like vibrant pinks/blues/teals as well. Deep blue-red (rather than fire-engine red) is good too. Any jewel tone is good as well. There aren’t very many colors I don’t like….what I may not like for a sweater, may look wonderful as an accessory or contrast. Married with grown children (college students) and a wonderful dog. Hmmm….it varies from month to month, but lately I’ve been real into felting (mostly bags/purses) or socks. I think I’m hooked on the “instant gratification” that you get from making them. Yes! They’re always so special! Bamboo and wood are my favorites…and I mostly use straights. If I’m doing something large (blanket or shawl) or a bag in the round, then I use circs. I don’t really care for plastic needles. For socks, hats, and baby hats, I use double points. 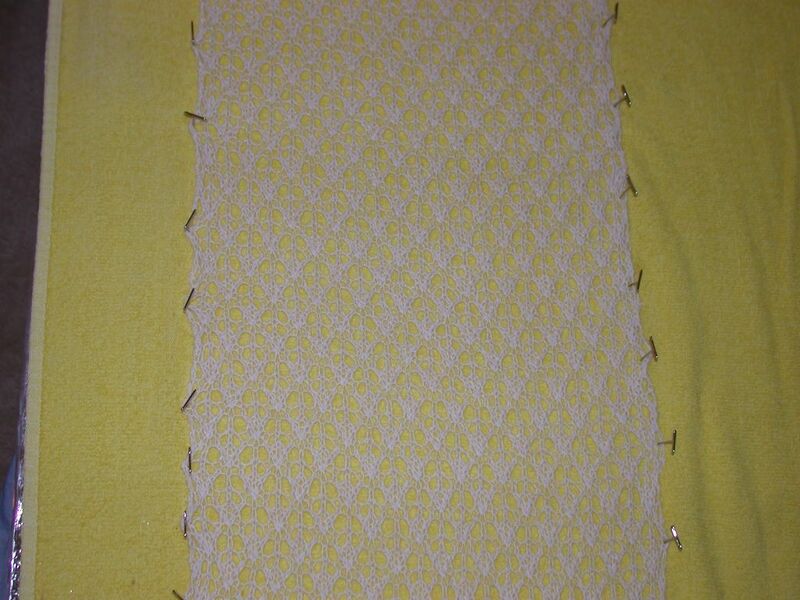 I rarely use metal needles….except for Addi Circulars. It really depends on the project and the yarn type. Taught myself. As a leftie, everyone I knew told me they couldn’t teach me ‘cause I was left-handed...so I kept at it and taught myself. I’ve felted by knitting an item and then felting, but I’ve never “felted” the fibers by them selves. I’ve also only tried needle felting once……don’t really know any of the “official” techniques. Any information on how to do with of these would be great! Where do I start! This weekend was the annual Maryland Sheep and Wool Festival. What a heavenly place to find "all things fiber". The selection of wools, silks, yarns, fleeces, spinning wheels, looms, and just stuff is AMAZING!!!! My feet are still recovering from all the walking....and multiple trips out to the car with my purchases! Every year, I reserve the first weekend in May for my annual trek to Maryland. If you've never been, you MUST go! It's fabulous. There are so many vendors for so many things! They come from all over the US, so you get a wide variety of items - from commercial yarns to custom dyed yarns and rovings. You're certain to find a "one of a kind" hand crafted needlework/fiber tool of some sort and at least one unusual "must have" item. I'm planning to post some pictures here of my purchases - yarn, tools, and fibers. Stay tuned! Today's mail brought a special treat. The Nostepinde that I'd ordered from Running Moon Farm had arrived! (see photo on the left). These folks are wonderful! I dealt with Margrett through the entire process. I expressed interest in purchasing a Nostepinde last Thursday. I got an immediate response from Margrett that they would craft several of them over the weekend and she would e-mail me photos so I could chose the one I want. On Sunday, I received an e-mail with pictures of 9 (yes, I said NINE) handcrafted Nostepindes. The variety of woods used and styles were wonderful! Margrett indicated that if none were to my liking, I should let them know and they'd craft some more. Wow! Given the lovely selections to choose from, I had a hard time narrowing down my choices, but with the help of my hubbie, I finally selected one. I e-mailed my order on Monday morning. Immediately, I received responses from Margrett indicating the status of the order each step of the way (order received, shipping date, and finally shipped). In addition, she indicated that if I did not like the Nostepinde once I'd received it, I just need to let them know and they would be glad to exchange it. Next step....becoming proficient at winding my yarn into balls using my new toy. Hopefully, these instructions will help! Oh......there's nothing quite as sweet as little lambs in the Spring. My dear friend Lisa invited me to join her on the studio tour. We'd gone a couple of times in previous years and really enjoyed ourselves. Local farmers and artists open their studios to the public. Of course, Lisa and I concentrated on the fiber related studios....Kiparoo Farm and Dancing Leaf Farm. Kiparoo was lovely...and Annie (the shepherdess) was gracious as always. She's had 200 or so lambs this Spring, so she's been very busy! I don't know where she gets the time to do her fiber artistry on top of this, but somehow she manages. I bought two patterns from her - a sock pattern with a garter stitch heel (I've always made socks with the heel gussett and am ready to try something else) and a pattern for two lovely knitted purses. Of course, I had to buy the yarn to make one of the purses as well! At Dancing Leaf, I had a real hard time deciding which of the lovely yarns to purchase from Dalis. She really has an eye for color and is a fabulous fiber artist. I knew I'd buy some of her super soft cotton for face cloths, but the selection of handpaints was irresistible! I bought a couple of skeins of her Salsa yarn (in mostly purples.....of course). My other purchase was 3 bundles of roving.....from happy sheep (free range sheep). Again, the colorway was predominantly purple (I'm soooo predictable! ).